So, 3.5 days of Akademy apparently means a lot of pictures being taken, I'm pretty sure everyone around has noticed this ;) Now I personally took a lot of pictures (again, most of you will have noticed that), which means that I also have a lot of data. Since I'm not really in the mood to upload 2.1G of data (at least, that's the current count), I'm not going to upload all of that somewhere (especially since a lot of those are actually out of focus, moved, generally blurry, bad, etc). Data Retention in Belgium: coming soon? Today, the BIPT (Belgian Institute for Postal Services and Telecommunication) released a draft of the implementation of the EU directive regarding data retention in Belgian Law at the request of the minster for Enterprising and Simplification (dunno how else to translate 'minister voor Ondernemen en Vereenvoudigen') (downloadable in Dutch and French). Read more about Data Retention in Belgium: coming soon? So, after Saturday's FOSDEM KDE Group Picture, perhaps it's now time to give a slightly fuller account of FOSDEM 2008 (with pictures). Since most of my pictures from the main tracks were too blurry anyway, I'll just focus on some of my pictures related to the KDE FOSDEM 2008 presence (leaving out some pics of individual persons and overview shots). Photos have only been resized and cropped where somewhat appropriate. 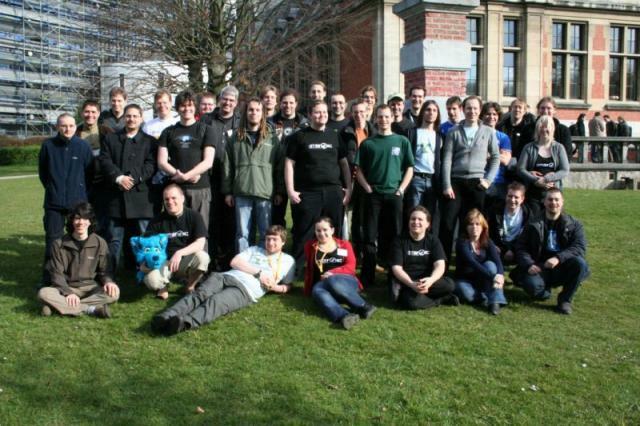 So, not only is it FOSDEM this weekend, I also organized a group photo for the KDE related people who are here. We went to the small field of grass in front of the KDE devroom. Luckily, the sun just started breaking through the clouds, so there was nice lighting (unfortunately I forgot to switch my ISO back from 1600, so it's a bit noisy nonetheless). Just so that you won't all forget: next weekend there's FOSDEM in Brussels. You can find the complete schedule in a handy grid layout here. For KDE people, I guess the most interesting non-main track talks could be those in the KDE devroom and the Crossdesktop devroom. So, given that I'd be on a holiday next week, I thought it would've been a good idea to do an upgrade of my Debian install on my laptop, in the hope that it'd use less power. The good news was that it seemed like it did, with slightly lower temperature (I guess due to tickless timer on AMD64 in the 2.6.24 kernel). The bad news was that I couldn't even try to quantify it at all: all my battery-measuring tools wouldn't work at all anymore. In particular, no KDE Battery Systray icon anymore, leaving me without any indication at all about how much battery I have left. While idly browsing through Wikipedia, I came across something very cool: the McGurk effect. Just read the Wikipedia page, and try it out with the linked YouTube video. I found the effect rather weird to experience :) (You can watch YouTube without creepy Flash plugins using ffplay/mplayer and the Konqueror YouTube servicemenu. FOSDEM KDE Talks: Hurry Up! Read more about FOSDEM KDE Talks: Hurry Up! Once again, there's a wonderful treat for people who want to take a look outside at night. Less than a year ago, I was pleasantly surprised to be able to see comet McNaught with the naked eye. This time, it is comet Holmes giving us a surprise show by suddenly brightening! More details are all over the net, like here.